With the International Festival of Arts & Ideas going strong for the next 12 days in New Haven (through June 26 - check it out an www.artidea.org), reviewing the Maya Beiser disk takes me back 2 years when she premiered the work at the 2008 Festival. It was a great gig, an impressive display of musicianship and social awareness, and whetted one's appetite for the recording and future live performances. The CD features 4 of the works commissioned for the project plus a rousing rendition of Led Zeppelin's "Kashmir." The program opens with "I Was There", from the pen of Iranian composer Kayhan Kalhor. Featuring the percussion of Jamey Haddad and Shane Shanahan plus the oud work of Bassam Saba, the work moves slowly on a cello solo before Saba changes the mood with his articulated lines. The percussion comes in 1/2 way through, giving the work a strong forward propulsion. "Memories" is a beautiful and haunting ballad composed by the Armenian Djivan Gasparian. Beiser creates a drone and weaves the melody around it, filled with sadness and longing but not despair. Israeli composer Tamar Muskat based his "Mar de Leche" (Sea of Milk) on a traditiona Ladino text (Ladino being a hybrid of Spanish and Hebrew. Saba, Haddad and Shanahan return, joined (in the beginning) by vocalist Etty Ben-Zaken. Muskat builds in many shifts in the piece's dynamics, flurries of notes and drum beats alternating with long, luxurious, melodic passages. American composer Douglas Cuomo contributed "Only Breath" based on Muslim-Andalusian Sufi chanting. With the aid of sound designer Sharakh Vadegari, the multi-tracked cello lines draws the listener into a world of peacefulness and contentment. In comparasion, the afore-mentioned "Kashmir" features the pounding drums of Jerry Marotta, thundering cello bass bowing and lovely harmonies. "Provenance" should be listened in one sitting, from the soft intro to the long, languid, fade on the Plant/Page tune (with melodic phrases coming at the listener from all angles. Is this the sound of peace, of nations reaching across borders to interact on human levels? Maya Beiser certainly believes so - we are better for her optimism and conviction. To find out more, go to www.mayabeiser.com. Following Signs - Justin Janer (Janer Music) - Justin Janer's alto saxophone work shone brightly on Bobby Sanabria's "Kenya Revisited Live" CD from 2009. For his self-issued debut, the Seattle Washington-native has gathered a group of young compatriots and created a CD that leans towards the influence of Wayne Shorter and Miles Davis' Quintet of the mid-60s. The front line features, on the rich, melodic, work of Ambrose Akinmusire (trumpet) and the shimmering piano work of Fabian Almazan. With Michael Davis and Will Clark sharing the drum duties (each on 4 tracks) and the solid bass work of Ruben Samama, Janer chooses melody over riffs and substance over flash. That's not to say the music doesn't have a groove. "California Sky" rides in on Samama's strong bass lines and Janer pushes the ensemble (minus trumpet and piano) forward. His ballad work is often stunning - atop more fine bass work, Janer creates an emotional palette on "Loss" that moves from grief to acceptance to moving forward (this track reminds me of Henry Threadgill's work with AIR.) "Song for Suji"has a well-defined melody and Akinmusire's solo work is heartfelt (fine counterpoint and support from Almazan.) The closing track, "Bump", starts slowly but picks up emotional steam from Clark's fine drum work along with Janer andAkinmusire's creative work. "Following Signs" offers a new voice and the promise of creative explorations. 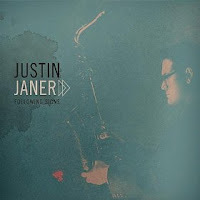 Justin Janer goes a long way to create music that stimulates the mind and ear. There could be bit more "fire" in the program yet, that is a minor quibble, for there is so much to enjoy in the melodic and creative interplay. For more information, go to www.justinjaner.com. 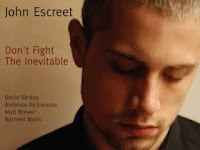 Don't Fight The Inevitable - John Escreet (Mythology Records) - For his sophomore effort, pianist/composer moves to David Binney's label and delivers a knockout of a CD. With Binney (alto saxophone) and Ambrose Akinmusire (trumpet) up front and the energetic rhythm section of Matt Brewer (bass) and Nasheet Waits (drums), Escreet has written music that is concerned with communication, with the participants listening to and reacting with each other - this is no "jam session". The title tune rumbles in on full piano chords, declaratory drumming and a short melody line. The solo section allows for Binney, Akinmusire and Escreet to stretch out. The trumpeter rarely sounds agitated, opting to rumble and clamor over the rhythm section. Escreet moves "in and out" playing with then against the rhythms. There is a calm at the onset of "Magic Chemical (For the Future)" that soon dissipates in th wake of fiery trumpet phrases and the leader's high-powered solo over Wait's slashing drum work. "Gone But Not Forgotten" is a quiet, lovely, ballad for alto sax and piano. Co-written by Escreet and Binney, the soft tones belie a sadness that make the piece stand out on the, mostly, high-energy program. On his Posi-Tone debut "Consequences", one could hear that Escreet was no clone and had no fear about allowing his music to go in multiple directions. So, the jabbering horns on "Civilization on Trial" give way to the jarring piano/electronics duet on "Soundscape" and it feels natural. The dark mood that permeates "Avaricious World" fits easily alongside the fiery rhythmic thrusts of "Trouble And Activity." The one non-original is Muhal Richard Abrams' "Charlie In the Parker" which features the voice of Charlie Parker talking about the future of music. 60 years (or so) after Parker uttered these words, creative music is still evolving bringing in the influences of international cultures and styles. Melodic invention, percussive drive, solos that do not go where one might expect, all that adds up to music that is multi-faceted, engaging and challenging. "Don't Fight the Inevitable" is both contemporary and forward-looking - the music and musicians take chances and no one settles for cliches. To find out more, go to www.johnescreet.com.